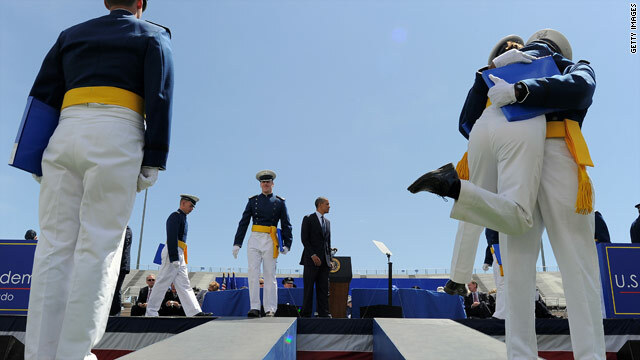 President Obama watches as members of the U.S. Air Force Academy class of 2012 celebrate. The president delivered the commencement address at the Academy Wednesday. COLORADO SPRINGS, Colorado (CNN) – In the race to collect campaign cash President Obama is expected to raise nearly $3.5 million dollars during his visit to Colorado and California this week. After delivering the commencement address at the United States Air Force Academy in Colorado Springs, Wednesday, the president travels to Denver where he’ll attend a reception at the Hyatt Regency. Seven hundred people are expected to attend, paying up to $500 each, according to a campaign official. It’s a much more upscale event when the president heads to Atherton, California for a fundraising dinner at a private residence Wednesday evening. About 60 people paid $35,800 each to get up close with the president and take in a performance by David Crosby and Graham Nash of Crosby, Stills and Nash, the official said. The president wraps up the evening with a much larger event at the Fox Theatre in Redwood City, California where 1,100 supporters are expected. Tickets start at $250 dollars each. Before flying to Iowa on Thursday to headline a campaign event and push clean energy, the president will attend one more fundraiser in San Jose, California, where a campaign official said tickets for the 20 attendees cost $35,800 per person. All of the money raised goes to the Obama Victory Fund, which is a joint effort of the campaign, the Democratic National Committee and various state Democratic parties. But somehow it is not considered a campaign trip so we pay for it... This address was very unpresidential. He was definitely in campaign mode (as usual). We got to hear how HE ended wars and how HE got BinLaden. He talked about how he didn't lead from behind. He addressed budget issues – he talked about how our military would be leaner and how he as commander and chief he would not make mistakes of the past. I GUESS IT'S ONLY PRESIDENTIAL WHEN YOU HEAR WHAT YOU WANT TO HEAR. KEEP ON CRYING JOHN. HAHAHAHAA!!! there comes a time when the talking and strutting will stop and we will have a REAL leader with a REAL resume and he will pull America together.